Rausch Productions provided production equipment rental and support staff for the Iowa State University's Fundraising Campaign Launch.Four years ago, through a professional relationship with Iowa State University on other projects, Rausch Productions was given the opportunity to provide production equipment rental and support staff for the college's Fundraising Campaign Launch. Over the course of the last three years, the company expanded from just doing the production to creating the whole event. Rausch Productions started working on the project in January 2007, with a show date in October. The event was for the 150th anniversary of Iowa State University and the launch of their comprehensive fundraising campaign. This year was unique in that it was a twofold event. The Iowa State University Foundation holds a donor appreciation event every year, but this year they coupled it with the 150th year celebration. 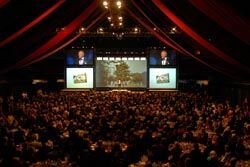 Ron Rausch, president of Rausch Productions, commented on the video used, "We had five projection screens and eight plasmas across. An Analog Way Di-VentiX was dedicated to the 18 x 32 foot central screen. The two 12 x 16 foot left and right screens were receiving the same feed from another Di-VentiX. The plasma sources came off a Di-VentiX too, and then our 9 x 16 foot screens all the way up above received contents processed by the Analog Way Graphic Switcher II. The three lower screens (the 12 x 16 foot and the 18 x 32 foot) and the plasmas became more background supplemental. Sometimes there would be video elements, moving backgrounds or static graphic elements. However our 9 x 16 foot screens up above became the IMAG and primary content screens. That's where we would cut our cameras and roll our primary video elements. Even though the primaries were up above, we had other video elements on the bottom screens as well. Nonetheless all of the main content for the big screen show came off on the two 9 x 16 foot screens." Five Analog Way switchers were used in the production, which included several screen sizes and multiple formats. Although two or three times during the program there were multiple video elements rolling simultaneously from tape to separate screens, Rausch mostly had all five switchers doing separate things. Everything was timed out so that different screens came up to life at different times. Rausch Productions had to set fairly complicated rules. In terms of sources for those switchers, they had four Mac laptops that were running Keynote for the graphic content and four Ikegami HL60W, 16:9 cameras: three of which had large lenses, 55X and 70X Canon, and one was a hand held unit. One was used for wide shots and two were cutting action on stage and there was also a handheld. For videotape sources, Rausch used two Sony DVCAM decks, three Doremi V1 hard drive systems, and DVD players for backup. All of the primary rolls and moving background came from these units. Although two or three times during the program there were multiple video elements rolling simultaneously from tape to separate screens, Rausch mostly had all five switchers doing separate things. Everything was timed out so that different screens came up to life at different times. Rausch reflected on the size of the set, "That was a pretty substantial set up. They were a little skeptical with the project at first. When we pitched this project back in January, we knew what we wanted to do in terms of content and the creative side of the production, but we did not have a set in mind, however, we had a pretty good idea of where we wanted to go with this. As we were talking to our designers, we did not allocate a substantial amount of the budget towards the creation of the set, as we didn't know what we wanted to create in the beginning of the project." Rausch recalled the planning process before the show came to fruition. "One of the keys was that we wanted to make it very interactive and technical. So we took the list of the inventory we owned and thought we could design something that would use several screens in the background. We were thinking about buying this 18 x 32 foot projection screen for this event and two other projects that we had, so we built it into the design. It also sealed the deal in us buying the Di-VentiX switchers. After working through some ideas, our designers came back with many variations of the drawing to show what we could do. It was a little beyond what we'd done before. Given the concept we knew we could do it, but we hadn't done a five switcher show in the past. We'd used the products in a lot of different settings, worked a little bit of edge blending, but it was the first time that we pulled the whole package together. As a result of this project's success, we have used variations of this design and setup for other clients." The university was pleased with the outcome, as Rausch explained, "Iowa State University was ecstatic and they were blown away by the immensity of the set and by the multimedia interactivity of it. A month after the campaign, they closed $20 million dollars in gifts and commitments. The events content, size and execution made a big impression on the attendees and we're still getting comments and feedback on a memorable program." For more information visit www.rauschproductions.com.